What the 87th Academy Awards lacked in record-breaking selfies, it made up for in tighty whities, Lego statuettes, and highly GIF-able moments. And darn if I am not a sucker for a good GIF! My favorite from Sunday night's broadcast? As much as I freaked out over dream duo Meryl Streep and Jennifer Lopez cheering during Patricia Arquette’s acceptance speech, the 2015 Oscars GIF that secured a spot in my heart is the GIF of when John Travolta gently grabbed Idina Menzel’s chin before the pair handed out the Academy Award for Best Original Song. Travolta held on a little too long, Menzel's smile never wavered, and lots of eye contact was established. I love me an awkward interaction, and this was a capital-A Awkward interaction. I can't stop looking at it. Is this my new favorite GIF of all of the GIFs in GIFland? Has the Travolta/Menzel chin grab GIF ousted the GIF of Ariana Grande flying across the arena in a bubble chair at the EMAs? Eh, jury’s still out. I will say this: It's definitely in my top 5 GIFs. 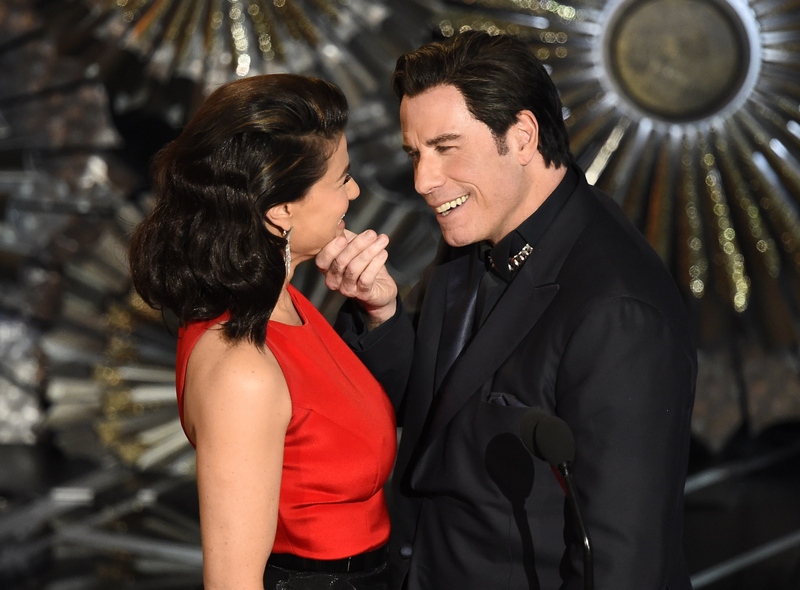 When should one use the Travolta/Menzel chin grab GIF? Oh, there are plenty of everyday scenarios that this GIF fits to a T. Next time you're emailing about/blogging about/tumblring about/texting about any of the following situations, may this be the droid, er, GIF you're looking for. When you're in a stare 'n' smile contest. First one to blink or stop smiling loses! When John Travolta lovingly grabs your chin without warning and you can't help but grin because what is haaaaaaappeniiiiiiing? It's the GIF that you want! Oo, oo, oo, honey! It's the GIF you need! Oh yes indeeeeed!